When we closed the store and no longer felt Amazon breathing down our necks, we went ahead and subscribed to Amazon Prime so we could catch up on things like Bosch, which customers had been telling us frequently they enjoyed. (And Bosch is excellent, very true to the books though not an exact replica). 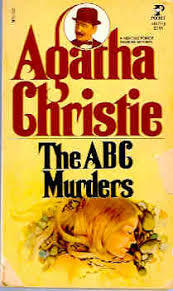 Prime’s The ABC Murders is not an exact replica of Christie’s enjoyable, early serial killer novel either. 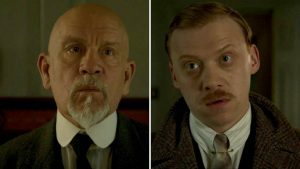 First there’s the casting of John Malkovich as Poirot. He doesn’t look like everyone’s mental picture of Poirot – that would be David Suchet – he’s instead an older, defeated Poirot, scraping along without his faithful valet, George, and his nightly hot chocolate. This Poirot is past his glory, and visited by flashbacks of his early life as a Belgian refugee. Christie purposely created Poirot as a refugee, as she wanted him to blend in, but still stand out. However, I doubt Christie was thinking about the PTSD someone like Poirot certainly lived with. This series takes a look at it. Then there’s the killer. In the book, Poirot is following a string of clues as the murderer taunts him and sends him letters, which he receives a little too late to prevent the first few deaths. He is here as well, but we see both sides of the equation, with Poirot not being on top of his game until a few deaths in. The book is a puzzle mystery as well as a serial killer book, and Poirot is there to put it to rights. In the book, he’s helped by his “Watson”, Hastings. In the book, he also works alongside Inspector Japp, who meets his maker early in this adaptation, and Poirot is forced to deal with the younger Inspector Crome who ridicules him and doubts he was ever a policeman. The killer, Alexander Bonaparte Cust, in the book appears to be an innocent travelling salesman. In the new series we know what’s up with him and see his anguish as he checks into a drab boarding house, takes up with the in house prostitute to indulge his fetishes, and is forced to eat nasty fried eggs prepared by a creepy and intrusive landlady. There’s also an overlay, both very contemporary and very 1933, of anti immigration feeling. In one scene Poirot is chased and jeered at for being Belgian, and in another he turns away his neighbor, who is wearing a fascist pin. Again, I’m sure this was an aspect of life in 1933 Britain, it just isn’t the one Christie focused on in her books. In short, Poirot’s “otherness” is continually emphasized, and not by virtue of an eccentric mustache and patent leather shoes. Malkovich’s mustache is ordinary. There’s a noir-ish overlay to the whole production, not the least, to me, exposing Poirot with all his human foibles. It’s an interesting riff on a classic, probably not for every viewer, but the settings are lush (the William Morris wallpaper! the landscaping!) and it’s fun to try and remember where you’ve seen this or that British actor in one BBC production or other. If you aren’t expecting the conventional Christie adaptation, you’ll probably find this suspenseful and thoughtful take on a classic worth a look.